To those of you reading this in January 2012, I’m very sorry for the delayed update. The WCN servers went down for maintenance, but all is well now. Thanks for your patience! 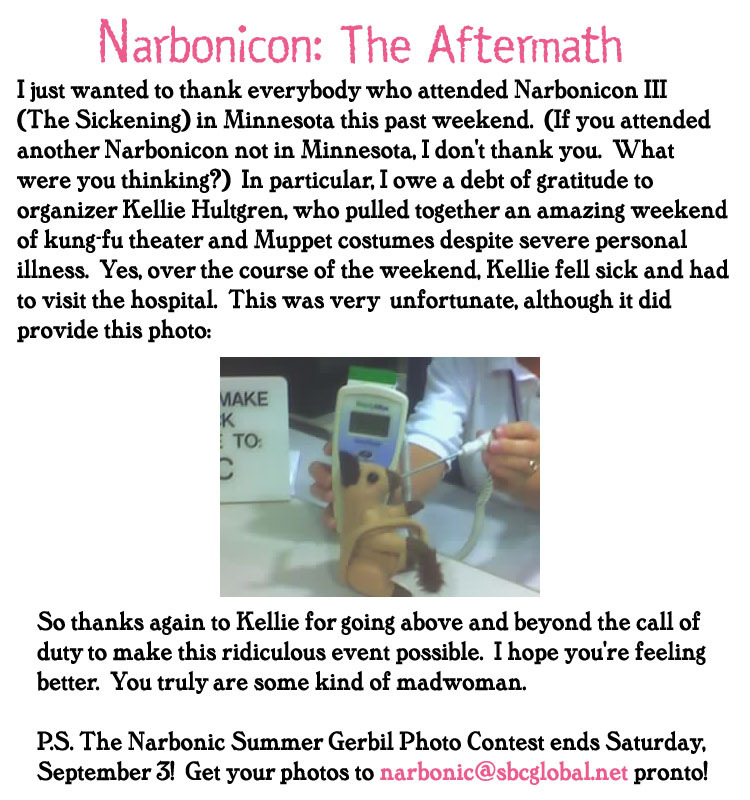 Anyway…I put this post together very quickly at the end of Narbonicon. “The Sickening” ended up being the official title of this one, thanks to the horrible, possibly-engineered-by-mad-scientists bug going around. We had a good time anyway. Events at this one included a trip to the play “Kung-Fu Hamlet” and a tour of the workshop where they make the costumes for “Sesame Street on Ice.” These may seem only tangentially related to Narbonic, but in fact Shakespeare and the Muppets are among the strip’s chief influences. Um… wouldn’t a gerbil get the thermometer inserted under the tail instead of under the tongue?